I had plans for a day long marathon of reading and caffeine but you know live gets in the way. I had my little reading nook ready to go. I got up, on Sunday morning, around 5:30, put on a fresh pot of coffee and sat down determined to read at least 300 pages. Not 5 minutes pass when I fell to sleep . I was woken up by the delightful Carolina, my youngest, around 7:30, when she tried to cuddle up with me. Needless to say I opted to play with her and make some breakfast. Later in the afternoon I gave it another go with similar results. Maybe next year I’ll plan it better, and include some reading with my little ones. All in all it was an awesome weekend, I just have to remember to buy a certain someone a red rose and a book. Yesterday I watch a heart-wrenching piece of art. One More Time with Feeling started as a glimpse into the recording of Nick Cave’s latest album Skeleton Tree but it quickly transforms into a harrowing testament of coping with the tragic loss of Mr. Cave’s teenage son. It was a moving and tear-jerking experience that honestly I hadn’t felt in a movie in a long time. This was part of the 12th annual cycle of documentaries presented by Ambulante there still a few days left of showings, you can check the schedule in the link above. And the trailer for this beautiful documentary you can see it here. So the winners were announced about a week ago and I just got around to look at the full list which you can find here. From this year winners, Olio was the one that caught my attention. A poetry collection by Tyehimba Jess. This in the spirit of keeping a promise to myself to read more poetry, a genre that I don’t read as often as I should. (Y-9) The first 10,000 pages of the year. Last night was one of those full of insomniac energy. Thanks to that I finally finish reading A Dance with Dragons, after 118 days. This gave me a total of 10,781 pages for this year and only 44,104 pages to go and 21 books to finish. A walk in the park. 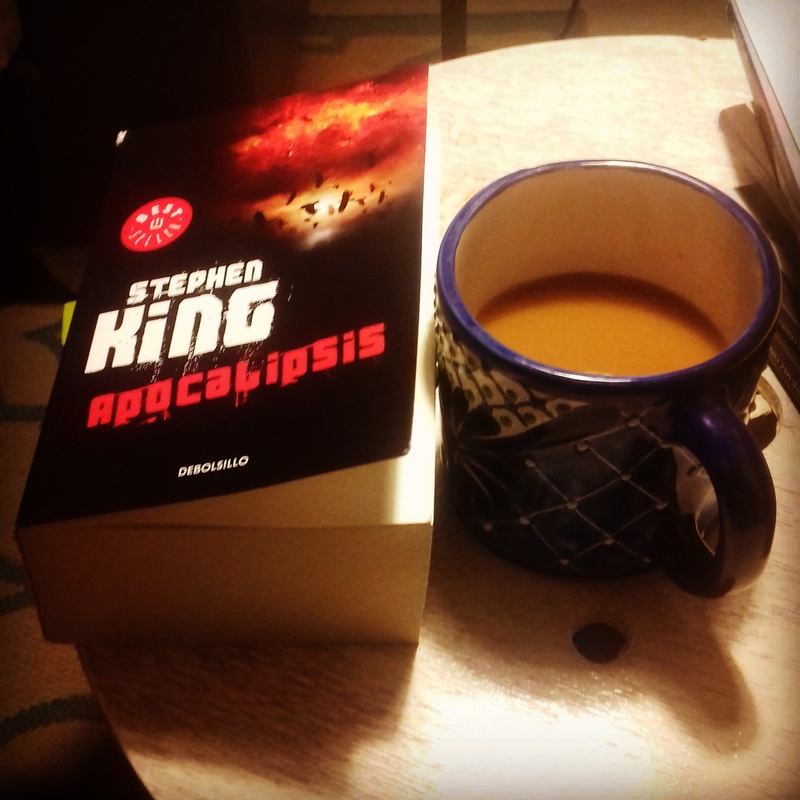 With that in mind, I dive right into the next book, Apocalipsis ( the Spanish version of The Stand) by Stephen King. Along with Jerusalem by Alan Moore and The Lord of the Rings by J.R.R. Tolkien, are the only massive books, each over 1,000 pages long, left in this year reading list. With roughly 6 months to go on my reading year, I feel focus and determined to complete the task at hand. Caffeine don’t fail me now. 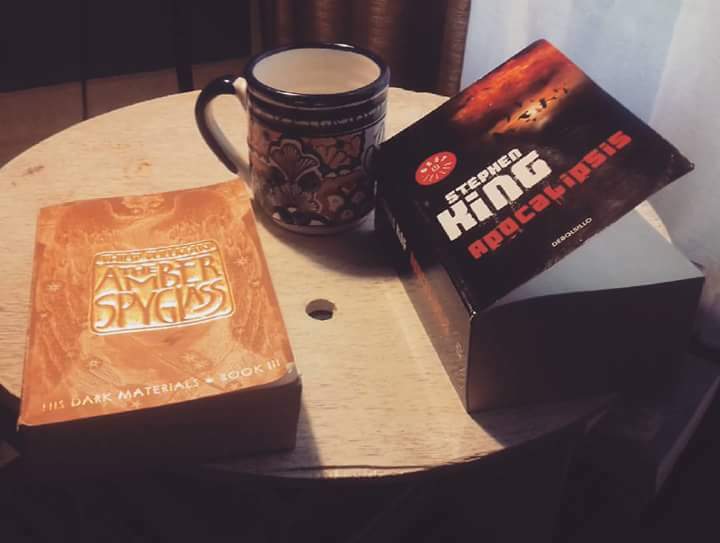 I’m on the final stretch of A Dance with Dragons, my plan is to finish it by Thursday night, and jump right in into my next big book, The Stand by Stephen King. The last two nights have been spent in my favorite reading spot, just hacking away at this terrific book. To be honest, I have been procrastinating with my reading, sometimes you need to recharge, so with that in mind, this weekend was just what I needed. What better to energize than wine and art. First I went to the Art Museum of my fair city, Ciudad Juárez, and was blown away with the fascinating collection of artist Carla Rippey, if you live in Juarez and even if you don’t you should go and visit it. And to finish the day some wine, the first “Festival del Vino Paso del Norte” , in hope that is only the beginning of many more years. I bought some great wine from producers in my home state, Chihuahua. Well with my batteries charge and ready to take on the next half of this year of reading, that present some gargantuan task.